Any container that I do buy I either recycle or look for a way to reuse. We have mountains of carrot juice bottles that I am always trying to find ideas for. This was a very fun simple activity to do and will help me when my daughter needs something quietly to play. I have been keeping it in my purse, and it has gotten me out of a few tantrums all ready. Take the plastic bottle, clean and dry it out very well. We collected anything from around the house that we thought could fit in the bottle from old bottle-caps to charms to stickers. While adding the objects to the bottle we kept a list going. When we used a sticker we just rubbed whatever substance we were going to fill the bottle with (sand, rice, beans) on the back side so it would not stick to the edge of the bottle. Then we added rice, beans, or sand (or a mixture to the bottle) to the bottle (fill it up just enough so that when you twirl the bottle around you can find the objects). Note: If using sand make sure the bottle is absolutely dry, I even took a blow dryer to it, or it will make a big mess for you. I put some glue on the lid and screwed it shut. Then I typed up the list on the computer, laminated it, and attached it with a string. A bottle with alphabet letters in it, to help the kiddos recognize their alphabet. A bottle with numbers in it. Bottles to go along with each season. Bottles to go along with the upcoming holiday! I love this idea! I just stumbled on your site and am enjoying your posts. 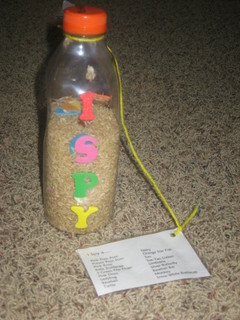 I just posted today on ideas for kids’ activities using items in your recycle bin. Will definitely link back to this one in the near future. Am adding you to the blogroll, thanks!